unwanted body hair. We all have it, yet we are almost all embarrassed by it. I don't know why it's so taboo because I don't know too many women who don't struggle with hair removal options. I was seriously considering getting professional treatments to get rid of my excess body hair. I have really thick, fast growing hair, so the idea of not having to shave my legs or underarms was appealing too. I hadn't scheduled any appointments because I know that it will be expensive, and I will have an hour driving time plus treatment time for each session. I simply don't have the extra time for several appointments right now. Thankfully, there's a new home hair removal system that works. 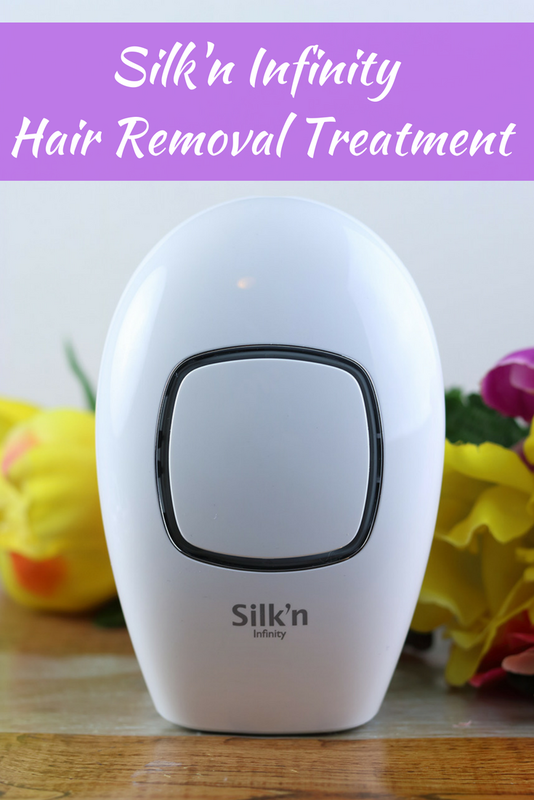 The Silk'n Infinity is their newest and best hair removal device for home use. Keep reading to learn more about it and how it works. HOW DOES THE SILK'N INFINITY WORK? The Infinity uses a new technology called Home Pulsed Light (HPL™) for better results. This safe technology uses optical light energy to remove hair. There's a quartz bulb that directs a pulse of light to the skin. This light is absorbed by the pigment in your hair and transformed into heat energy. The heat energy destroys the hair, which prevents it from growing back. Since it targets the pigment in the hair, it won't affect your skin. This is why this method is almost painless. The Infinity also uses galvanic energy. There's an electrode plate on the back of the device. When the electrode touches your skin, the pores open, letting the light get down to the hair follicle. This helps remove stubborn hair. It also helps tone your skin, improve circulation, and allow more of your post-treatment lotion to absorb into your skin. If you're new to home hair removal, you need to know that this works best on dark hair on lighter skin tones. Silk'n has a chart here that will help you decide what energy level to use and what type of results you might expect. No hair removal treatment will get rid of all of your hair in one treatment. Hair grows at different rates, and some hair may be dormant for months. You will need to do another treatment a few weeks after the first one. Your first one to four treatments should be two weeks apart. For treatments five to seven, wait four week in between treatments. You might still need to do some touch up treatments after this, depending on your hair growth cycle. You can use the Silk'n Infinity on your legs, arms, underarms, bikini line, and on your face (under the cheekbones). I've never used a home hair removal device, so I didn't really know what to expect. Honestly, I am not a fan of stinging pain, so I was scared to try one. Most users don't have any pain, according to Silk'n. As I said, I have dark, thick hair. I did feel a little tingling, but I think that's just due to having thick hair. It was definitely tolerable, and I will continue treatments. There are five energy levels, so you can adjust the strength. The Silk'n Infinity is fast; a full body treatment takes about 20 minutes thanks to the light pulses that happen at intervals. The Silk'n Infinity is a splurge for sure, but it's a worthwhile one in my opinion. Waxing and razors are expensive. Add up all that you spend on them, and I'm sure you'll hit the $399 price tag of the Infinity pretty soon!